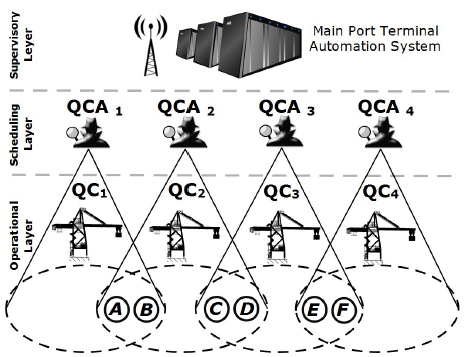 Abstract: For sea port container terminals, a key objective is to increase the container throughput by minimizing the amount of time necessary to load into and discharge containers from a ship using quay cranes (QCs). In this paper we discuss the situation in which some tasks can be handled by multiple QCs, represented by so-called overlapping area constraints. Overlapping area constraints determing the tasks that more than one QC could take care of. We formulate a distributed QC scheduling problem with overlapping area constraints and cast this problem as a Distributed Constraint Optimization Problem (DCOP). A new negotiation algorithm called Extended Asynchronous BackTracking (E-ABT) is then proposed for solving the DCOP. Reference: I. Zabet, R.R. Negenborn. Quay crane scheduling with overlapping constraints: A distributed constraint optimization approach. In Proceedings of the 2014 IEEE International Conference on Networking, Sensing, and Control (ICNSC 2014), Miami, Florida, pp. 303-309, April 2014.